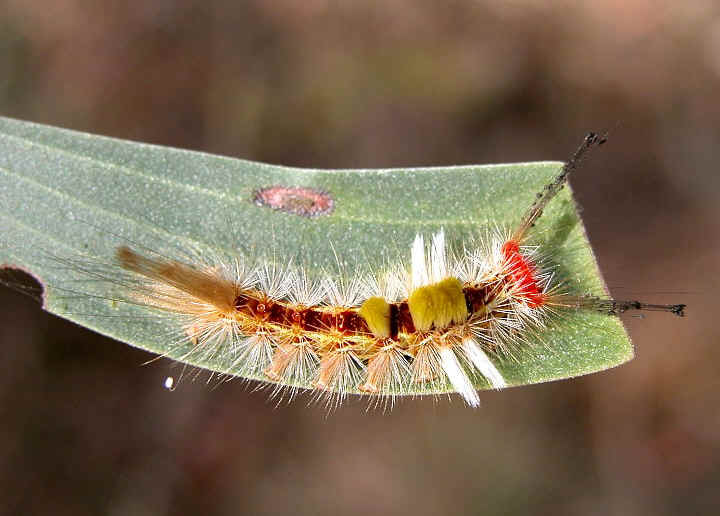 This page contains information about Painted Pine Moths that we found in the Brisbane area, Queensland, Australia. 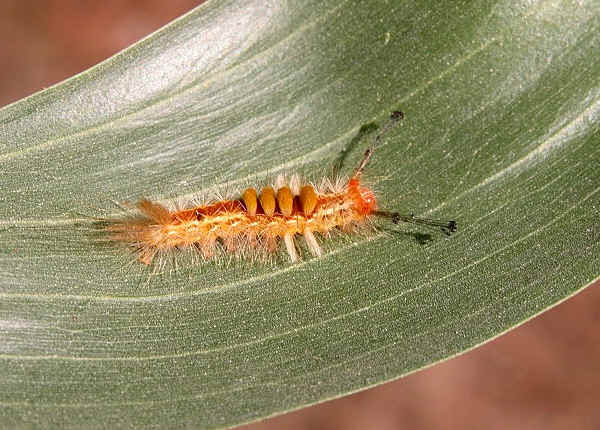 They are also known as White spotted Tussock Moths. 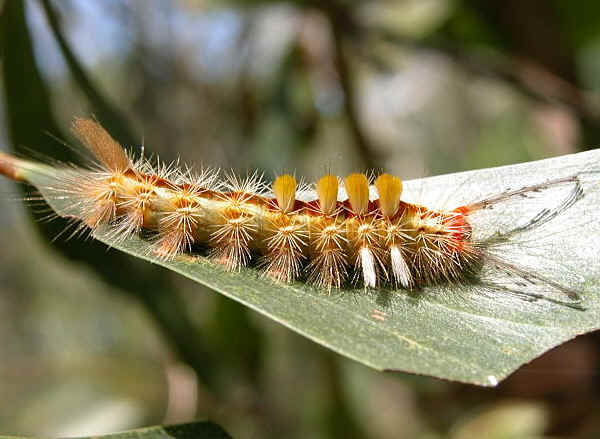 The Painted Pine Moth Caterpillars have the typical Tussock Moth Caterpillar look. Its head is bright red in colour. They are hairy, with four distinct tussocks of hair on their back make them look like a toothbrush. The hair can cause irritation if contact. They are common in Brisbane. 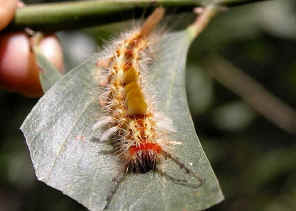 They are usually found feeding on leaves during the day. 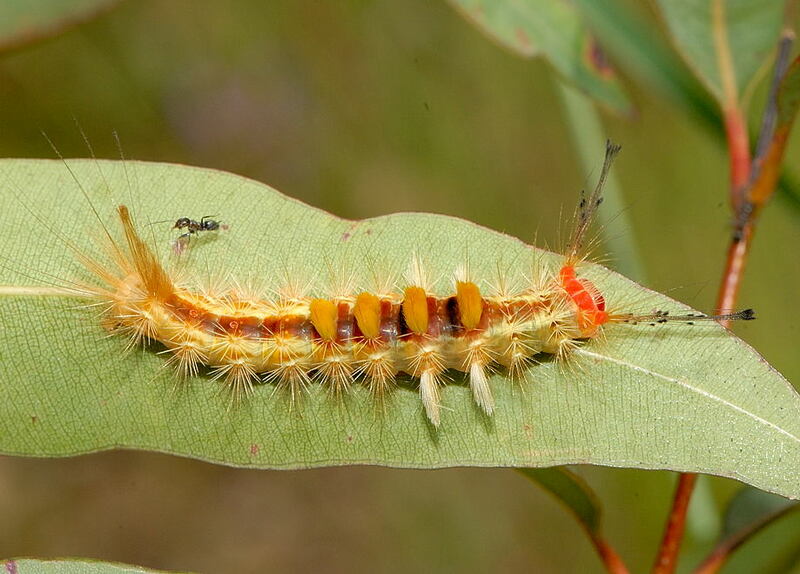 They feed on different type of trees including gum, wattle, Mangrove, Grevillea and as their name implies, pine. 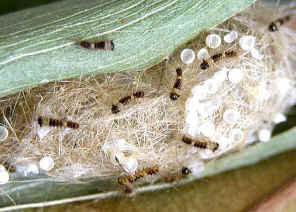 The caterpillars pupate in a woven cocoon under bark or foliage. 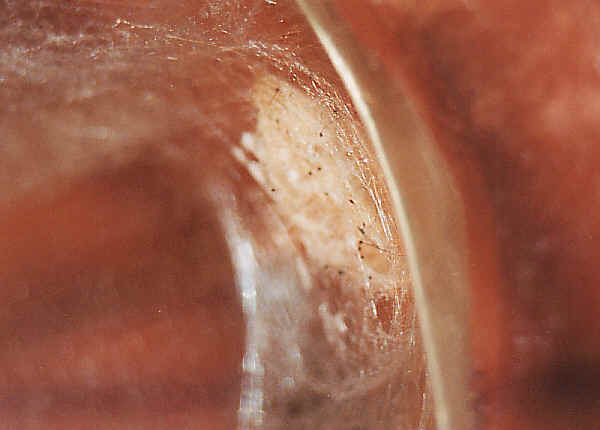 The pupa covered with larval hairs which can cause problems if touched, or if they are released to blow about. As their common name imply, they feed on pine tree. Although they do not make big damage on the pine tree, their hairs course urticaria to the pine industry operators. They are considered as pest to the pine industry. From the reference information, Painted Pine Moth caterpillars originally feed on Wattle Acacia and most other garden plants. 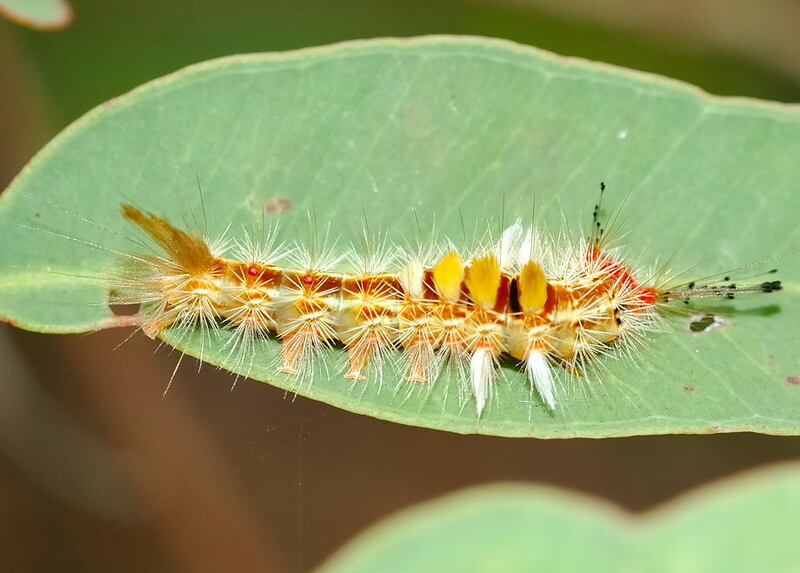 They also have the common name Painted Acacia Moth. We found a Painted Pine Moth Caterpillar feeding on Camellia flower on late Spring 2002. We took the caterpillar home to see how it would look like when it became a moth. We brought along with extra amount of Camellia flowers and leaves as the caterpillar's food. To keep the flowers fresh, we put them in our refrigerator. We put the caterpillar in a jar with those flowers and leaves. The jar was covered by a cloth and tighten by rubber bend. We cleaned the jar everyday. We put some more flowers and leaves in the jar everyday. 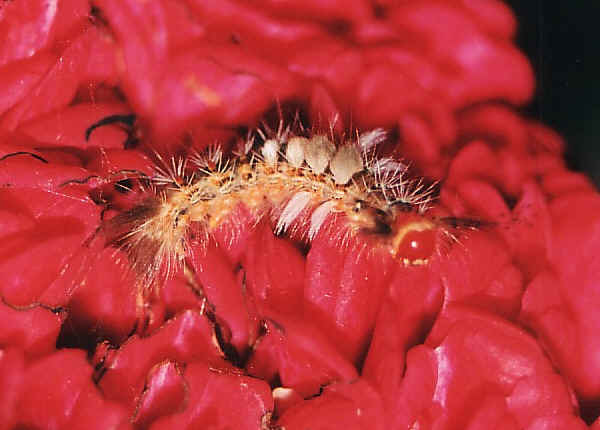 We found that the caterpillar feed only on the Camellia flowers and not on the leaves. When we found the caterpillar, it was 20mm in length. After a few days, the caterpillars moulted. It looked the same except larger, it became 30mm in length. After another week. it pupated in a woven cocoon. 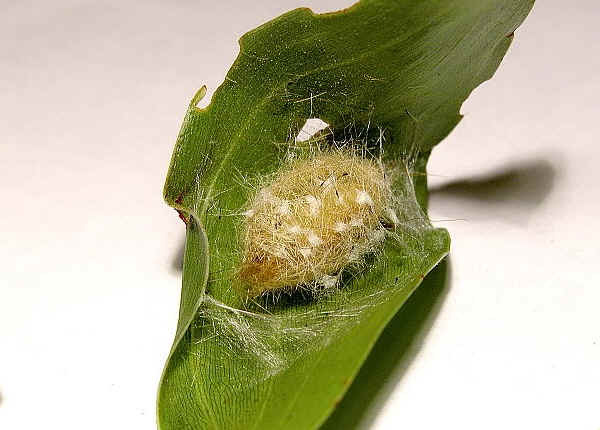 The pupa was covered with some hairs of the caterpillar. These hairs may cause irritation if contact, or if they were released to blow about. So we handled it very carefully. After the caterpillar became a pupa, we did not need to clean the jar. After another two weeks, it became a moth. The moths was medium in size with hairy body. It held their board wings like roots over their abdomen at rest. There were the white and brown blue patterns on its wings. 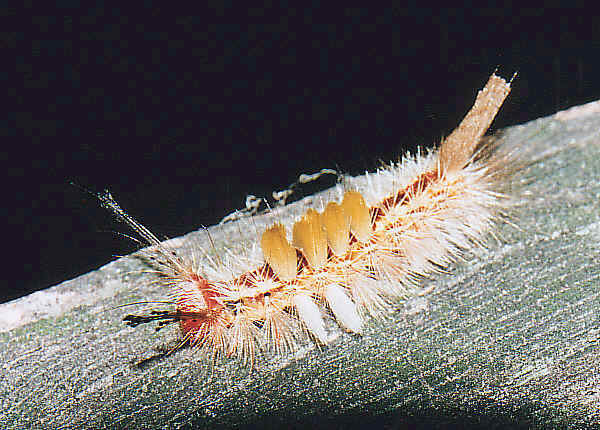 It had the typical Tussock Moth male antenna. This moth is active at night, so we opened the jar and put it in our backyard at night. 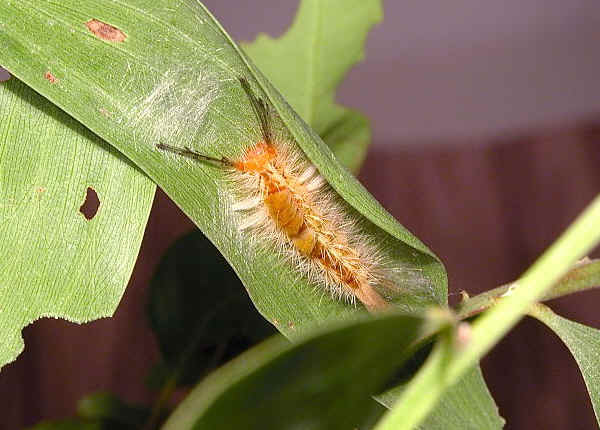 To raise caterpillars is fun, especially if we find an unknown caterpillar. It is easily too. 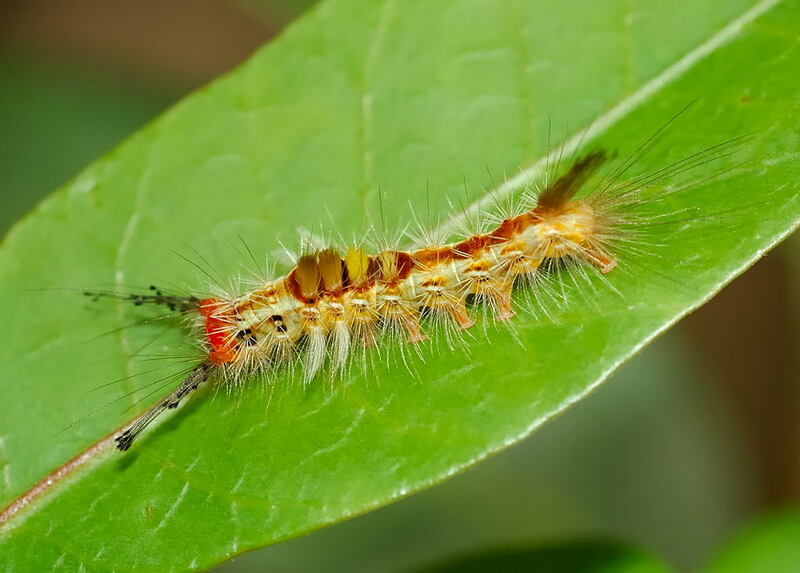 We have raised some caterpillars such as the Wanderer, the Crow , the Orchard Butterflies and the Common Anthelid Moths. You may like to raise one too. 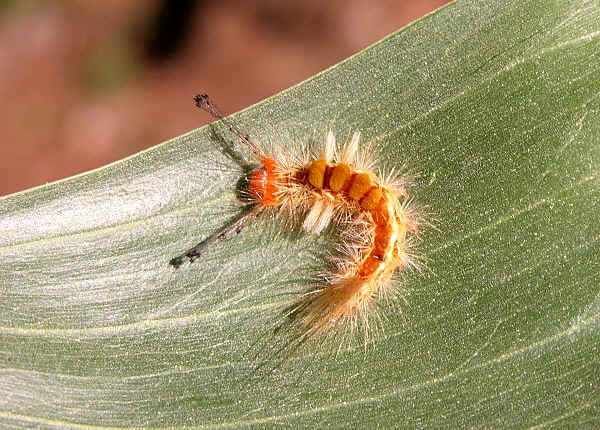 Try it yourself next time when you find a caterpillar. Email me if you successfully raise one or if you find any problem. 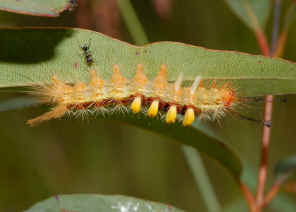 On 2004 late summer, we found another caterpillar on Black Wattle Acacia, which is the same as the caterpillar above but larger in size. The caterpillar was covered with dense golden yellow hairs. It had a pair of long black tufts of hairs at the head which pointed forwards like horns. Like most tussock moth caterpillar, it had four tufts of creamy yellow hairs on the back, just like tufts of bristles in a toothbrush. On both sides near the first two tufts, there were two tufts of silver white hairs. It also had a tuft of creamy yellow hairs on the back near the end of the abdomen. The caterpillar moved slowly and fed on the Black Wattle leaves. 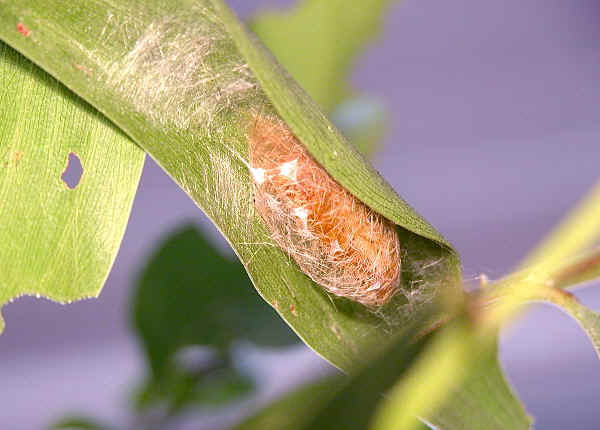 Two days later, under one of the wattle leaf, it found a suitable place to make its cocoon. It first used silk to curve the leaf to make a good cover. Then it used more silks to make the loosely-spun cocoon. 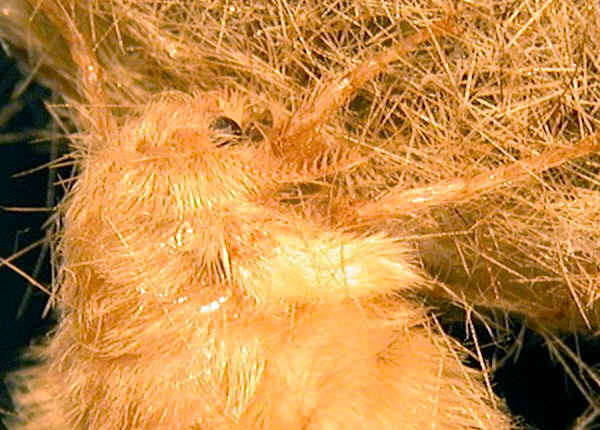 It used most of its hairs to cover its cocoon. We knew these hairs can cause urticaria if touched, or if they are released to blow about. So we handle the cocoon with extra care. 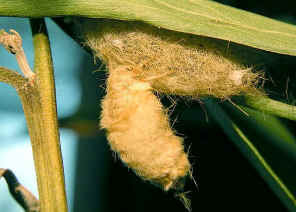 About 10 days later, to our surprise (we did not know the female is wingless), a small fellow came out from the cocoon. It did not look like a moth. It was creamy white in colour, look like a short sausage covered with dense hairs. Examined it more carefully, we realized that it was a wingless moth. We then checked the reference books and found that the Painted Pine Moth females are wingless. 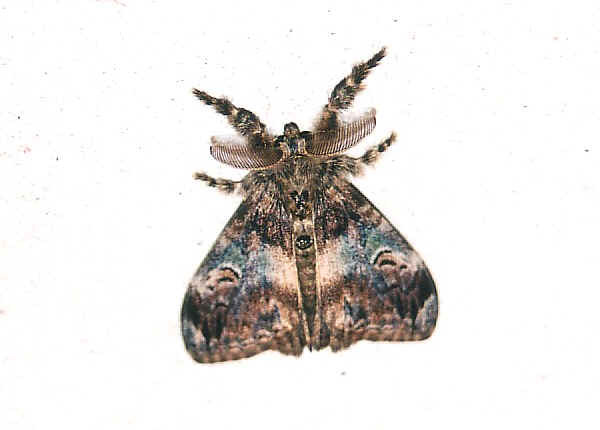 Actually the 'wingless' Painted Pine Moth females do have wings. Check carefully at the above pictures, we saw the tiny front wing and hind wing. Something more interesting was still to happen. The female Painted Pine Moth just stayed with its cocoon and did nothing. Three or four days after it came out from cocoon, it laid eggs on the cocoon. 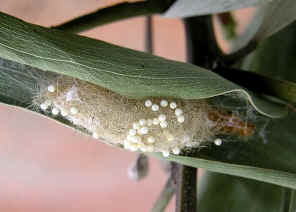 Those eggs covered most of the cocoon and then it dropped on to the ground and laid some more eggs. The eggs were white in colour. Total number of eggs estimated from one to three hundreds. Because we thought the wingless moth will not fly away, we did not cover the jar which kept the moth. 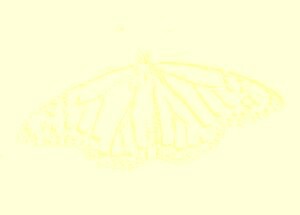 Anyway, we did not think the female moth had chance to mate and so the eggs were unfertilized. We did not expect caterpillars would hatch from those eggs. To our big surprise, three days later, caterpillars came out from those eggs!! In fact, all those eggs turned into caterpillars, included those on the floor. Few weeks later after we found the larger female caterpillar, we found a smaller caterpillar and it made its cocoon when its length is 30mm. We knew it would be a male Painted Pine Moth moth. Few days later it spun the cocoon in exactly the same style except smaller in size. 1. Orgyia australis Walker, 1855 - Don Herbison-Evans & Stella Crossley, 2008. 2. Moths of Australia - I. F. B. Common, Melbourne University Press, 1990, p428, fig43.7, plate30.10, plate30.11. 3. Moths of Australia - Bernard D'Abrera, Lansdowne Press, Melbourne, 1974, p72. Last updated: April 08, 2009.